Summer riding is fun, until it’s not. Sweaty, gross and un-cool looking hands are a fast track to the latter. For riders in search of keeping the good times rolling, fashionably, and without turning their mitts into slosh buckets of sweaty grossness, the Roland Sands Strand Gloves are ready to get in the game. Constructed with an outer shell that combines mesh textile fabric with leather accents for a bit of added style, the Strand motorcycle gloves are all about keeping the air flowing throughout. The stretch mesh addition to the gloves allows for more comfort throughout the range of motion while the Clarino palm provides great tactile feedback on the controls. 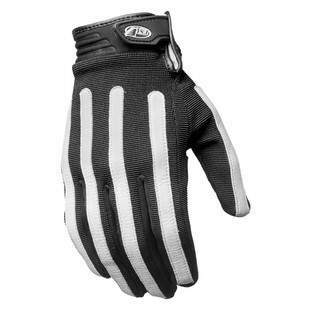 Additional features of this short cuff, low-key motorcycle glove include a pre-curved fit, neoprene cuffs, and cell-phone touch screen compatibility. In the end, motorcycle gloves are important. Sweaty hands in motorcycle gloves, however, kind of stink. With both of those things in mind, Roland Sands created the Strand gloves to provide riders with a pair of hand holsters that allow for the former while eliminated the latter.